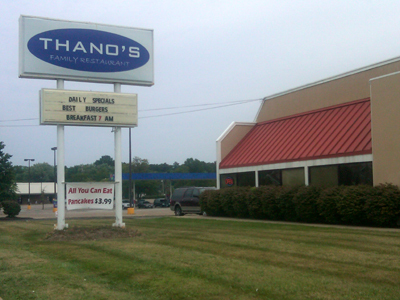 Another Barberton eatery I had been hearing about for a while but had never seen let alone tried, Thanos ends up sitting right in the middle of the parking lot of a big shopping center, and I had driven past it a few times without ever seeing it. While the name evokes thoughts of the Mediterranean, the menu and place are much more Americana with a couple of Greek flourishes. The exterior of the building doesn’t promise much but the interior is bright and clean with an open kitchen and a real family casual atmosphere. The clientele this day appeared to be a wide variety of natives and they remained about a quarter full throughout the time we were there for lunch. 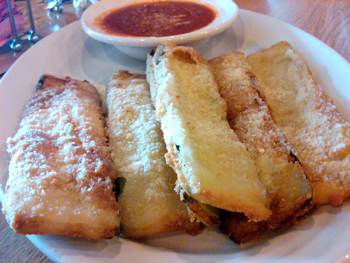 We ordered a Fried Zucchini Appetizer which was sprinkled with cheese and served with a tasty Marinara. Hot, crunchy, we were definitely off to a great start. Having been hankering for a good gyro, being spurred on by the name, it was no surprise that was my choice. I don’t think Greek is necessarily their specialty. The gyro was certainly passable but no better than you would expect from any pizza place. Certainly not the grandeur of Bill’s in Atlantic City. The server said the onion rings were worth the upsale and they were good. Breaded instead of battered and well fried, when you take a bite it’s done enough to get a clean bite and the rest of the onion itself doesn’t try to slither out from its crusty exterior. The surprise was the burger and fries. Thick steak fries, simple but perfectly performed, they are so good I don’t think I would order the rings again. The burger was tasty, well seasoned, well grilled, but the blue cheese reminded me of the pressed nuggets that come in the plastic containers at the grocery store. You know, the ones that say “blue cheese” instead of Gorgonzola or Danish blue or Amish Blue etc. 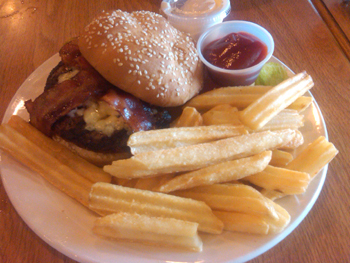 It distracted from a really solid tasty burger and really good fries. The first thing we noticed walking in was a hazy deli case full of pies. I am a pie fanatic and it has been a hot minute since I had a slice so we ordered a sugar free cherry and lemon meringue. 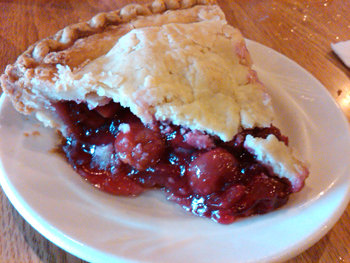 Both pies feature a mealy crust which I did not expect for the fruit pie and would have preferred something more flaky. The filling itself, although sugar free, didn’t lack any sweetness or flavor at all. Overall it was a success. 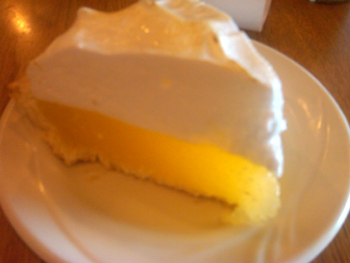 The lemon meringue featured a bright and fresh lemon curd full of tartness and capped with sweetened egg whites. The service is practiced and seems to be on top of things. They also did a nice job recognizing regulars sitting around us. Thanos has a bit of a "Cheers" feel to it, a place where folks tend to spend a lot of time. I was pleasantly surprised by my first visit to Thanos and there are some other things I would like to try on the menu, including the Greek Pasta, but it will be hard not to just stick with the burger and fries.